(May God defend us!) to shield from harm. Where headstones broken on old graves lie. Charmeth the witch and the wizard off! For he heals the hurts of the conjured ones. To the graveyard rabbit go for peace! To whoever shall sever his furry feet! The August Carival is themed "Favorite Cemetery Photo." My favorite picture is a favorite because it is so personal. 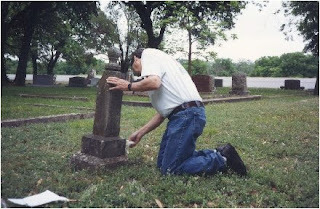 This is my husband, David, cleaning the grave of his great grandfather William Christopher Wright. Every year he rides his Harley across the country. He never fails to stop in Kerrville, Texas to say "Hello" to GGrandpa and put flowers on the grave. Until he started visiting I am pretty sure that William hadn't had a visit in a hundred years. I have spent at least 20 years researching this Grandpa. He was living in Missouri when he became very sick with TB. At the time it was thought that Kerrville, Texas had the right combinations to improve TB. So he went with his wife to live there. There was a street called Cottage Street where most TB patients lived. Cottages lined the street. Each cottage had a outside sleeping porch where it was thought that sleeping outside would improve your health. In this case it didn't help and he passed away. Annie, his wife, buried him here then returned to Missouri. It is so touching to me that my big, rough, tough, Harley husband is so sensitive to his family and ancestors. This is the sweetest picture and story. It is hard to believe your Big, Rough, and of course Teddy Bear of a man would have such a wonderful heart. Great picture and great post; I love it when we can catch our guys doing things like this. What a wonderful picture.See why he's a keeper with that photo!Thank you for sharing the story it is inspiring!